Summer is here, which means that the outrageous mane your pet sports right now could be swelteringly unpleasant unless you take steps to de-shag it. Besides that, all pets need a certain level of grooming throughout the year, including regular brushing, nail trims, spot trims on critical areas of their fur and more. A trip to a professional groomer can often do the trick for the fancier breeds and more difficult-to-trim animals, but pet owners can reduce their reliance on pro groomers and keep their animal feeling better if they learn to take care of certain tasks themselves. 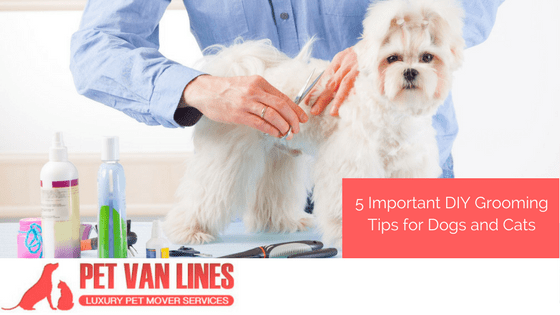 To help your pet feel better and to make things like trips on pet transportation services easier, try putting these five DIY grooming tips to good use in your own home. Your first step is to not skimp on getting the right tools for your pet, including tools made specifically for your pet’s type of coat. Every long-haired pet or pet that tends to shed a lot needs a shedding blade. These teardrop-shaped devices remove excess fur efficiently and in a way that is pleasant to your pet. You can also get rake-shaped shedding combs that can get rid of excess hair and increase your time in between trim sessions. For cats and pets with longer hair, go out and get a quality brush with deep tines. Depending on your pet’s comfort level, the tines may need plastic caps to prevent them from feeling uncomfortable on their skin. Luckily, dogs and cats both seem to love brushing, so you can keep them more hygienic and feeling better with the added bonus of having less fur to vacuum. For trims, a typical set of scissors or electric hair clippers may not do the trick. Pet-specific clippers like this one have a different trimming mechanism to get deep within fur without pulling hairs or irritating skin. To trim long hairs on your dog’s or cat’s haunches, which can tend to hang on to unpleasant waste, you can use a product like ScaredyCut, which adds on a comb guard to help you get the right fur length and avoid snipping skin. One of the biggest tasks pet owners tend to delay are nail trims. Since both dogs and cats walk on their nails every day, ignoring long nails can make a bad problem worse while making trims tougher over time. Trimming most dogs’ nails is easy. Make sure you purchase an effective guillotine-style clipper to make sure you can chop off nail tips cleanly and without causing the animal too much distress. Be wary of your animal’s quick — the blood vessels within the nail bed — since cutting too low can cause serious bleeds. Having some styptic powder and gauze nearby never hurts! For cats, clipping nails is done most easily with the pet in your lap facing outward. Position the animal between your thighs on their tail base so that their belly and feet stick outwards. Your best bet is keeping the animal calm and resisting any wriggling gently but firmly. Hold their paw out and apply gentle pressure on each nail to reveal the retracted claw. Talk to the pet to keep them calm, and feel free to take breaks to avoid them getting overstimulated. Conclude each trim session with praise and treats. The more positive experiences the pet has with each trim, the less hesitant they will be the next time. Cats rarely need baths unless they have persistent fleas or get into something too messy for them to lick off themselves. Dogs, on the other hand, should be bathed at least once every two to three weeks to prevent oils and dirt from causing infections or other complications. Use a shampoo designed just for dogs since human shampoos can often cause dry skin. For both cats and dogs, holding them by their chest to control movements can help keep them calm since the more movement they have, the more likely they are to enter “escape mode” and flee. Talk to your pet to soothe them, and consider peppering treats throughout when they act calm. Moves are a distressing time for animals, and while a door to door pet relocation service can make the trip easier, having your pet’s nails trimmed and fur groomed can go a long way towards keeping them comfortable over a long journey. With these tips, we hope you and your pets look more fabulous together and can enjoy a close relationship and healthy lifestyle no matter how hot it gets.